Vaudeville was a genre of variety, family-oriented entertainment that appeared after the American Civil War in the United States and Canada and grew in popularity until its demise in the early 1930s. 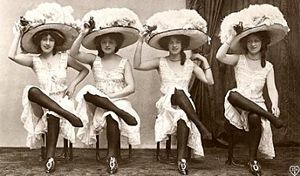 Vaudeville developed from many sources, including minstrel shows, circuses, medicine shows, and burlesque theater, and by the turn of the century emerged as the first modern big business entertainment. Each evening's bill was made up of a series of separate, unrelated acts, including musicians (both classical and popular), dancers, comedians, trained animals, magicians, female and male impersonators, acrobats, one-act plays or scenes from plays, athletes, lecturing celebrities, minstrels, and short films. Vaudeville was indirectly an outgrowth of the Industrial Revolution. The new working class, made up of many European immigrants, sought entertainment and relaxation suitable for the entire family. The rise of vaudeville can be seen in part as a reaction to sordid, often licentious entertainments common to beer halls and traveling shows. The early vaudeville pioneer Tony Pastor, for example, was a devout Catholic who had an altar backstage where he prayed regularly. Benjamin Franklin Keith's wife and business partner was a fervent Catholic, and his vaudeville program was originally financing by the church.Vaudeville also played a role in presenting black entertainers beyond the racially demeaning stereotypes of earlier "blackface" comedy. At its peak there were about 25,000 artists working in 4,000 theaters. Vaudeville gradually lost its competitive standing with the rise of new entertainment, particularly talking cinema. Many of vaudeville's performers would later achieve fame in more modern entertainment venues like musical comedy, radio, movies, and TV. From a newspaper advertisement for Vaudeville character, comedian Charles E. Grapewin in a top hat, for a sketch titled "Above the Limit". The term vaudeville is generally traced to two French phrases: Val de Vire, meaning "valley of the river Vire" and voix de ville, meaning "voices of the town." This particular valley and river were where the satirical song-writer Olivier Basselin lived in the fifteenth century, and in the sixteenth century the word became synonymous with a catchy song lampooning a town and its people. The rage for vaudevilles in 1792 led to the opening of the Theatre du Vaudeville in Paris. The true beginnings of vaudeville in America lie somewhere in the mix of medicine shows, minstrel shows, Wild West shows, and the circus. Variety theaters existed as early as the first decades of the nineteenth century. Theatre goers could enjoy a performance of Shakespeare, acrobats, singers, dancers, and comedy all in the same evening. As the years progressed, seekers of diversified amusements found an increasing number to choose from. A handful of circuses regularly toured the country, dime-museums appealed to the curious, amusement parks, riverboats, and town halls often featured "cleaner" presentations of variety entertainment, while saloons, music-halls, and burlesque houses catered to those with a taste for the risqué. In the mid-1840s, minstrel shows, another type of variety performance were followed by medicine shows that traveled the countryside offering programs of comedy, music, jugglers and other novelties along with their tonics, salves, and miracle elixirs, while Wild West Shows provided romantic vistas of the disappearing frontier complete with trick riding, expert shooting, music, Native Americans in costume, and drama. 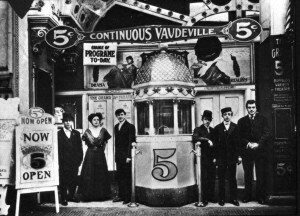 Vaudeville incorporated these various itinerant amusements into a stable, institutionalized form centered in America's growing urban hubs. In the early 1880s, Tony Pastor, a former ringmaster with P.T. Barnum's circus who turned theatre manager, capitalized on middle class sensibilities and spending power when he began to feature "polite" variety programs in several of his New York City theaters. The usual date given for the "birth" of vaudeville is October 24, 1881, when Pastor staged the first bill of his self-proclaimed "clean" vaudeville at Tony Pastor's New Fourteenth Street Theatre. Hoping to draw a potential audience from female and family-based traffic Pastor, a devout Catholic, barred the sale of alcohol in his theaters and eliminated questionable material from his shows. He pioneered the Ladies Matinees by offering the first 25 women gifts of sacks of potatoes, hams and silk dresses. Pastor's experiment proved successful, and other managers soon followed suit. Pastor died shortly after his theatre closed in 1908. While he never got wealthy off his idea many others made millions following his lead by booking family entertainment in a chains of theaters throughout the country. Performance bill for Temple Theatre, Detroit, December 1, 1902. 1) Burt Jordan and Rosa Crouch. "Sensational, grotesque and 'buck' dancers. A good act…." 2) The White Tscherkess Trio. "A man and two women who do a singing turn of the operatic order. They carry special scenery which is very artistic and their costumes are original and neat. Their voices are good and blend exceedingly well. The act goes big with the audience." 3) Sarah Midgely and Gertie Carlisle. "Presenting the sketch 'After School.' … they are a 'knockout.'" 4) Theodor F. Smith and Jenny St. George-Fuller. "Refined instrumentalists. 5) Milly Capell. "European equestrienne. This is her second week. On account of the very pretty picture that she makes she goes as strong as she did last week." 6) R. J. Jose. "Tenor singer. The very best of them all." 7) The Nelson Family of Acrobats. "This act is composed of three men, too young women, three boys and two small girls. The greatest acrobatic act extant." 8) James Thornton. "Monologist and vocalist. He goes like a cyclone. It is a case of continuous laughter from his entrance to his exit." 9) Burk and Andrus and Their Trained Mule. "This act, if it can be so classed, was closed after the evening performance." Names like Percy Williams, John Considine, Marcus Loew, Martin Beck, Frederic Freeman Proctor and Alexander Pantages followed Pastor's lead but it was B.F. Keith who built an empire of theaters that would ultimately control all vaudeville venues. Later, E.F. Albee, managed the chain to its greatest success. They had met while touring with P. T. Barnum's circus. 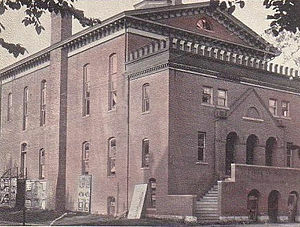 Circuits such as those managed by Keith-Albee provided vaudeville's greatest economic innovation and the principal source of its industrial strength, enabling a chain of allied vaudeville houses that remedied the chaos of the single theatre booking system by contracting acts for regional and national engagements that could grow from a few weeks to two years. Keith's first taste of running his own entertainment business came when he opened a dime museum in 1883 in Boston where variety shows were featured. When he opened the B. F. Keith's Theatre in March of 1894 his focus was vaudeville and his success was immediate. He soon opened numerous other theaters in New England and throughout the Northeast. Keith gave national prominence to vaudeville's trumpeting of "polite" entertainment, a commitment to entertainment equally inoffensive to men, women, and children. Acts who violated this ethos (e.g., using the word "hell") were admonished and threatened with expulsion from the week's remaining performances or with the canceling of their contracts. In spite of such threats, some performers routinely flouted this censorship, often to the delight of the very audience members whose sensibilities were supposedly endangered. But Keith attracted loyal family audiences with families that were performers. One such example was the composer and Broadway producer George M. Cohen, his wife and their two children. 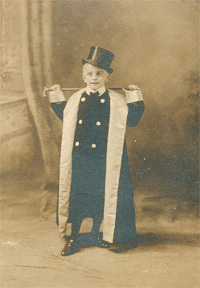 Prior to vaudeville it was unheard of to put children on the stage or in the audience, but wholesome families of entertainers attracted families as customers. By the late 1890s, vaudeville had large circuits, small and/or large houses in almost every sizable location, standardized booking, broad pools of skilled acts, and a loyal national following. At its height, vaudeville played across multiple strata of economic class and auditorium size. As performers rose in renown and established regional and national followings, they worked their way into the less arduous working conditions and better pay of the big time. The capitol of the big time was New York City's Palace Theater, built by Martin Beck in 1913 and operated by Keith. Featuring a bill stocked with inventive novelty acts, national celebrities, and acknowledged masters of vaudeville performance (e.g., comedian and trick roper Will Rogers), playing the Palace meant you had made it to the top. By 1925 the Keith-Albee circuit had 350 theaters and employed 20,000 people. In 1927 it merged with Orpheum and added another one hundred. While the neighborhood character of vaudeville attendance had always promoted a tendency to tailor fare for specific audiences, mature vaudeville grew to feature houses and circuits specifically aimed at certain demographic groups. African-American patrons, often segregated into the rear of the second gallery in white-oriented theaters, had their own smaller circuits, as did speakers of Italian and Yiddish. White-oriented regional circuits, such as New England's "Peanut Circuit," also provided essential training grounds for new artists while allowing established acts to experiment with and polish new material. Prior to the Civil War, and before slavery was abolished, minstrel shows were quite popular. These shows started in 1828 and were popular from 1841-1870. The white performers would go on stage and mimic the "down on the farm" lifestyle of the slaves on the southern plantations. To play this role they would cover their faces with burnt cork, a style of make-up called black-face. Although this type of show today would be considered racially degrading, in the mid-1800s it was popular with the white audiences. After the Civil War these minstrel shows lost their popularity. But some minstrel acts moved onto the vaudeville stage, bringing their black-face make-up with them. These performances led to African-Americans themselves putting on black-face make-up and creating vaudeville routines. Initially African-American performers put on black-face so that they would be accepted by the audience, since the mostly white audience had never seen African-American entertainers. Vaudeville was the first popular entertainment in America to have an African-American celebrity, Bert Williams. Despite being black and well-educated, Williams wore black-face and performed in the dialect of an uneducated black. Williams, however, did not poke fun at his own race but was a comic genius in his own right. He would use his comic talents to create universal situations that would be humorous to the low-income members of his audience who were themselves newly arrived immigrants. Eventually black-face was eliminated in vaudeville as well, and in 1918 Noble Sissle and Eubie Blake were among the first African-American entertainers not to use black-face make-up. Writers of "I'm Just Wild About Harry," they were known as the Dixie Duo and would later create the Broadway musical Shuffle Along. They were singer/songwriters on the vaudeville stage long before racial equality came to the rest of society. There was no abrupt end to vaudeville, though the form was clearly staggering by the late 1920s. Vaudeville suffered from the rise of broadcast radio following the greater availability of inexpensive receiver sets, but the continued growth of the lower-priced cinema in the early 1910s dealt the heaviest blow to vaudeville, just as the advent of free broadcast television was later to diminish the cultural and economic strength of the cinema. (Ironically, cinema was first regularly commercially presented in the United States in vaudeville halls). 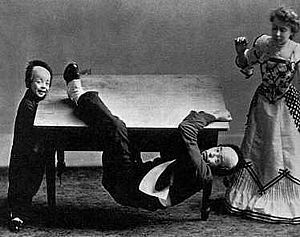 Six-year-old Buster Keaton with his parents Myra and Joe Keaton during a Vaudeville act in 1901. Other vaudevillians who entered in vaudeville's decline, like Abbott and Costello, Kate Smith, Judy Garland, Fred Astaire and Rose Marie, used vaudeville as a launching pad for later careers, leaving live performance before they had ever risen to the meteoric height of national celebrity. By the late 1920s, almost every vaudeville bill included a healthy selection of cinema. With the introduction of talking pictures in 1926, the burgeoning film studios removed what had remained, for many, the chief point in favor of live theatrical performance: spoken dialogue. Theatre owners discovered that rental costs of films—when held against the price of performers, newly unionized stagehands, booking fees, lighting, orchestra, etc.—vastly increased their profits. 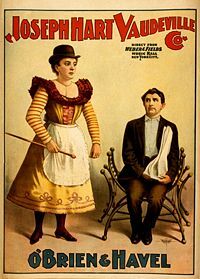 Performers tried hanging on for a time in combination shows (often referred to as "vaudefilm") in which, in an inverse of earlier vaudeville, live performances accompanied a cinema performance. Inevitably, managers further trimmed costs by eliminating more of these comparatively costly live performances. The 1930s, with standardized film distribution and talking pictures, only confirmed the end of the genre. By 1930, the vast majority of theaters had been wired for sound and none of the major studios was producing silent pictures. For a time, the most luxurious theaters continued to offer live entertainment, but the majority were forced by the Great Depression to economize. The shift of New York City's Palace Theatre, vaudeville's center, to an exclusively cinema presentation on November 16, 1932 is considered the final death knell of the art of vaudeville. Fierce competition for customers by the magnates resulted in theaters that were luxurious, elegant, and grandiose. B. F. Keith's New Theatre, like F.F. Proctor's Pleasure Palace, adapted the excessive and opulent architectural styles of Southern European palaces to create buildings with few precedents in American cities. The front of Keith's New Theatre featured a wealth of decorative detail. Wrought iron decorations, stained glass, incandescent lighting, gargoyles, arches, and marble pillars drew the people in. Once in the lobby and foyer the opulence continued with white and green marble, burnished brass, leather upholstered furniture, large plate mirrors, and enormous panel paintings by the "eminent artist Tojetti." Keith commissioned Domenico Tojetti to create panel paintings above the huge and heavily gilded proscenium arch inside the auditorium, complimenting the ornate white and gold balconies, twelve private boxes, and walls of green and "rich" rose "in a brocaded silk effect." The design of Keith's New Theatre overlooked nothing. From the elaborate hand-painted ceiling to "the finest toilet and retiring rooms in the country" to the number of "fragrant floral displays," the offering of "the purest artesian well water" and the "writing materials furnished free—gold pens, sterling silver handles, monogrammed paper and envelopes..."
On the West Coast Alexander Pantages also sought to make his vaudeville theaters distinct and novel. His long association with the Scots architect B. Marcus Priteca (1889-1971) began in 1911 with the San Francisco Pantages and continued through the 1920s. Priteca used domed ceilings and stained glass, as well as other stylistic flourishes that suggested opulence. Gilt and bronze were featured in the interiors, and murals and tapestries complemented the inlaid marble floors. The largest of the theaters, the Hollywood Pantages, built in 1930, seated 2800 persons. In collaboration with the decorative painter A.B. Heinsbergen, Priteca designed and oversaw the construction of 22 theaters for Pantages. The Orpheum Theatre in Wichita, Kansas represents one of the finest remaining examples of theatre architecture developed during vaudeville's heyday. It was an integral part of the famous "Orpheum Circuit" where virtually every major star of vaudeville appeared, including such luminaries as Eddie Cantor and Fannie Brice. In 1980 the Orpheum was placed on the National Register of Historic Places. The Orpheum (1700 seats) was conceived as a garden of old Andalusia. Its entire design was that of a Spanish garden or court. It had a fully developed decorative theme that included a proscenium arch as the main feature of the auditorium. The sidewalls of the auditorium were accented by niches with mock tile roofs and grills and wooden lattice work arches across the ceiling to create a courtyard effect. The incredible Hippodrome in New York City even played a brief role in vaudeville history when it was leased to Keith-Albee, who created a much smaller stage and discarded all of its unique features. In 1925, when movies were added to vaudeville programs to compete with the newer and more sumptuous movie palaces in the Broadway-Times Square area Keith-Albee, by then merged into RKO, sold it. Small-time vaudeville included countless more intimate and locally-controlled houses. These houses were often converted saloons, rough hewn theaters or multi-purpose halls, together catering to a wide range of clientèle. Some of the most prominent vaudevillians continued the migration to cinema, though others found that their talents did not translate well into different media. Some performers whose eclectic styles did not conform well to the screen, like Bert Lahr, fashioned careers out of combining live performance, radio and film roles. Many others later appeared in the Catskill resorts that constituted the Borscht Belt. As the genre declined, most performers left the theatre; here the kid hoofer Ray Wollbrinck, once called "the cleverest buckdancer on the vaudeville stage"
With modern technology coming to the fore vaudeville began its decline, but rather than just disappearing it remained alive in the succeeding media of film, radio and television. The screwball comedies of the 1930s reflect the more madcap comedic elements of some vaudeville acts like The Three Keatons, The Marx brothers, Jack Benny, and Fred Allen. In form, the television variety show owed much to vaudeville, riding the multi-act format to success in shows such as "Your Show of Shows" with Sid Caesar and The Ed Sullivan Show. Great talents like Milton Berle, Bob Hope, and George Burns all got their starts in vaudeville. Even today, performers such as Bill Irwin, a Macarthur Fellow and Tony Award-winning actor, are frequently lauded as "New Vaudevillians." Irwin is known for his vaudeville inspired performance art in which he performs silent comedy in old-fashioned baggy attire. Irwin studied classical acting at Oberlin College and clowning at the famed Ringling Brothers' and Barnum & Bailey Clown College. In 2005, Lazer Vaudeville opened at the John Houseman Theater on 42nd Street in the heart of New York City’s theater district. The show enjoyed such popularity that it ran for seven months, moving to the larger Lamb's Theater in Times Square. The show combines the modern high-tech effects of lasers and black lights with the traditional vaudeville arts of juggling, comedy and acrobatics. The show currently does an annual tour of the U.S.
↑ Grove's Dictionary of Music and Musicians (1911), p. 234 Books.google.com Retrieved October 5, 2007. ↑ Samuels and Samuels, 15-22. ↑ [http://www.musicals101.com/cohanbio1.htm George M. Cohan, A Biography] Musicals101.com. Retrieved October 14, 2007. ↑ S. D. Trav. 2005. No applause, just throw money, or, The book that made vaudeville famous: a high-class, refined entertainment. (New York: Faber and Faber. 2005. ISBN 0571211925), 202. ↑ Laser Vaudeville Lazervaudeville.com. Retrieved October 5, 2007. ↑ Samuels and Samuels, 266. ↑ Vaudeville! Xroads.virginia.edu. Retrieved October 13, 2007. ↑ Alexander Pantages, 1876-1936) Historylink.org. Retrieved October 12, 2007. ↑ Orpheum History Wichitaorpheum.com. Retrieved October 13, 2007. ↑ NYC Architecture] Nyc-architecture.com. Retrieved October 13, 2007. ↑ Bill Irwin Hollywood.com. Retrieved October 5, 2007. "Home Page". American Vaudeville Museum. Keyser, Wayne N. 2005; "Glossary of Vaudeville Slang". Blue Ridge Entertainment. "J. Willis Sayre Photographs". University of Washington Libraries Digital Collections. "Prior and Norris Troupe Photographs". University of Washington Libraries Digital Collections. "19th Century Actors Photographs". University of Washington libraries Digital Collections. This page was last modified on 16 January 2016, at 16:41.